A couple weeks ago The Baby Cubby reached out to me for a collaboration and I have been so excited to share this post with you guys. I really love this store, guys. The Baby Cubby has both an online store as well as a retail location in Lindon, UT. When I say they carry everything to meet your baby + mama needs I mean it! 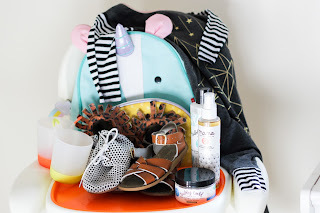 From preparing for baby's arrival, to raising baby into a toddler, they carry not only all the essentials, but all the extra fun stuff, too. They definitely aren't just "another baby store". They only offer the best and safest gear so you can shop confidently. From decorating the nursery, to the perfect stroller, bath essentials, baby-wearing, clothing and beyond, they've got you covered. They carry many of the top brands that everyone is going crazy about, including: Tubby Todd Bath Co, Puj, Freshly Picked, Rags to Raches, Alice & Ames, Mon Petit, Little Unicorn, Boon, Gathre, Baby Jogger, Stokke, Tegu, Bannor toys, 4moms, and so much more. They price match (even Amazon!) and all online orders of $49 ship for free. I have a 15 month old and a 3 year old, and while I am not currently in the "baby" phase of life right now, The Baby Cubby still has much to offer for the "toddler" phase. Some items I already own and love, and some I want and need. 3. A cute, washable rug? Yes, please! 4. I'm all about storage and organization. These bins are so cute! 3. We currently have this high chair and it's been great! 1. I had no idea they carried this play makeup. I've been wanting it for Dollie! 2. These bath toys look so cute and fun! 5. We have the unicorn back pack for Dollie and she's in love with it! 2. We are obsessed with out Gathre mat, and a micro for changing diapers would be great! 3. I've said lots before and I will continue to, we LOVE Tubby Todd bath products! 2. Same goes for Stance socks! 4. And Saltwater Sandals are our fave! Except that I could have added loads more to each category. So good, people! I could have easily created an entirely different have/want post strictly for newborn/baby. It would have included petunia pickle bottom diaper bags, owlet baby monitor, sakura bloom slings, puj bath tubs, and on and on and on. So many amazing things! If you live in Utah you definitely need to get to the Lindon store and see this stuff in person. They also carry things in store that aren't online.